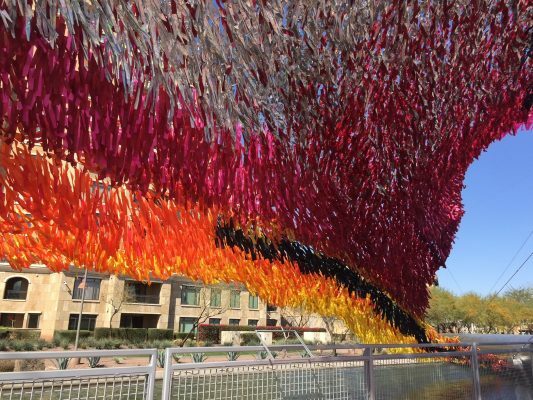 PHOENIX — If you’re an art lover, you can get your fill – for your eyes, ears, and body – at Canal Convergence in Scottsdale this weekend. Kim Curry-Evans is the public art director for Scottsdale Public Art, which is putting on the event. She said the Scottsdale Waterfront will feature art from around the world as well as Arizona. Inspired by “the quiet beauty of the desert,” the lanterns absorb sunlight during the daytime and release a colorful glow at night. You can bring your own bike – or grab a free one (first come, first served) – and do a night-time tour of public art around downtown Scottsdale. Riders should meet at Soleri Plaza near the main stage by 6:45 p.m. The event’s free and runs from 4 p.m. to 10 p.m. on Friday and Saturday. It is also running March 2 and 3 at the same time.